Watch video to learn more about these mats. InfraMat Pro TAO-MAT (PEMF) — FREE SHIPPING6 SIZES: 32″ x 20 / 60″ x 24″ / 72″ x 24″ / 76″ x 32″ / 74″ x 28″ PRO PLUS (double the negative ions / QUEEN SIZE 80″ x 60″ & KING SIZE 80″ x 76″Used Alone OR Can Enhance Hyperbaric Oxygen Therapy . PULSE MAGNETIC THERAPY or PEMF (Magnetic Fields) (FDA approved) directly stimulates cellular repair. PEMF therapy has been shown to be effective in the treatment of a variety of musculoskeletal issues and injuries, recovery from surgeries, and enhances athletic performance. Speeding the repair of bone fractures and alleviating symptoms of arthritis, PEMF therapy has been used for decades by increasing blood flow by 30 percent and have been clinically proven to deliver improved and accelerated recovery. The mat uses the same PEMF process as the $6000 Medithera Home, iMRS Well Fit, Omnium1, BEMER and QRS PEMF mats but available at an affordable price! Recommended for people who live stressful life, feel less energetic, pain relief, reduce inflammation, increased circulation, and wish to improve their overall well-being. The pulsing magnetic field actually charges the cellular battery to power up ATP and cellular function to stimulate repair and regeneration. PEMF also magnetically opens blood vessels and breaks apart clumped blood cells for increased circulation and better Nutrient transport. 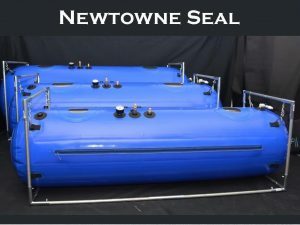 Used in conjunction with HBOT our mats help the body hold, carry and circulate more OXYGEN. 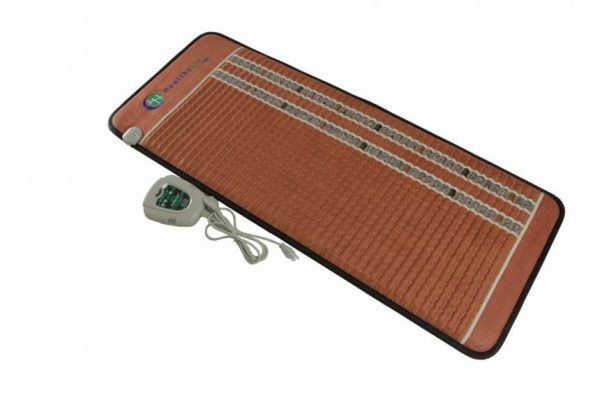 PEMF (Pulsed Electro Magnetic Therapy) PEMF or pulsed electromagnetic field therapy is a process of applying magnetic fields to the body. It is used to help with joint repair, blood circulation, and brain function. Frequencies between 0 Hz to 100 Hz (Hz is a measure of cycles per minute) have been found to be beneficial. HealthyLine uses a frequency of 7.8 Hz which is the same frequency as the earth’s magnetic field which also helps to reverse the effects of harmful EMFs cause by electronic waves such as radio towers and cellular data. The PEMF function operates at cycles of 20 minutes powered followed by 100 minutes turned off: this cycle has shown to be most effective. 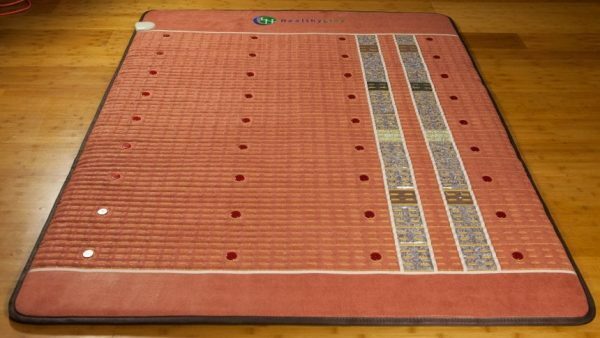 At 3 gauss the magnetic field is has the same strength from the surface of that mat up to 3 feet above it, so it will reach your entire body. Negative ion therapy increases collagen production within the body’s tissues promoting healthy skin and bones. Negative ion therapy also increases the permeability to cells which allows them to absorb nutrients more easily. This helps the body’s cells and tissues rejuvenate and heal from injury and illness. Negative ions have also been shown to help decreased the symptoms of depression and anxiety. They also help to decrease the overall acidity in the body as well as to counteract the damage from electromagnetic field (EMF) radiation that comes from cell phones and computers that many of us are exposed to on a daily basis. The 74″ mat offers you double the Negative Ion output. Photon therapy is comprised of light particles that can help correct bio-magnetic imbalance in the body as well as help reduce blockages within the body’s systems. It has also been shown to help the cells breakdown and release stored up toxins, promoting better overall health. Photon therapy has been used for years as a non-medicine pain reliever and anti-inflammatory. It has also been used to combat nerve damage from illness or accident. How do Gems Come Into Play? Amethyst is a purple stone that has been used in medicine since ancient Greece. It is known as a sedative-like stone with properties that make it ideal for meditation and calming practices. It has been used for centuries as a restorative gem and is also known to be a superconductor of energy. This means that amethyst helps to focus infrared and photon energies into the body. Black obsidian is known as a protective stone that removes negative energy from the area. 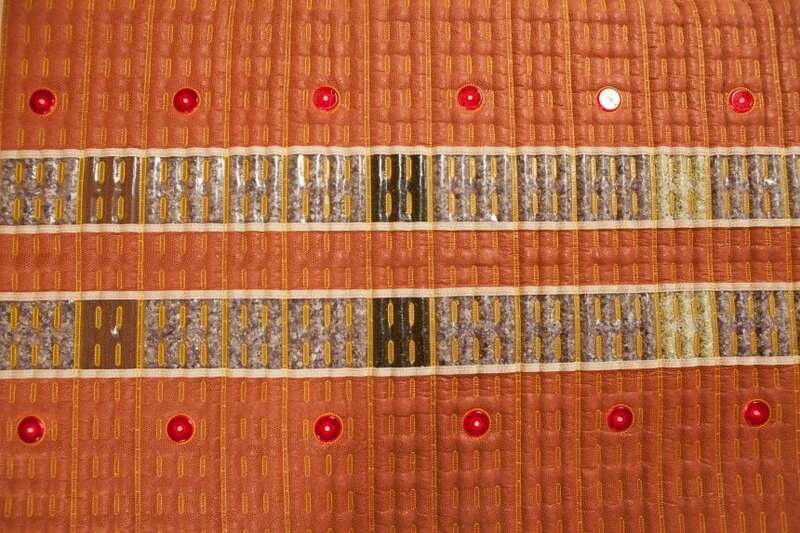 The TAO combination is good if you don’t want/need the photon lights from the TAJ mats. TAO mats also have the highest proportion of amethyst, making them a comfortable choice. 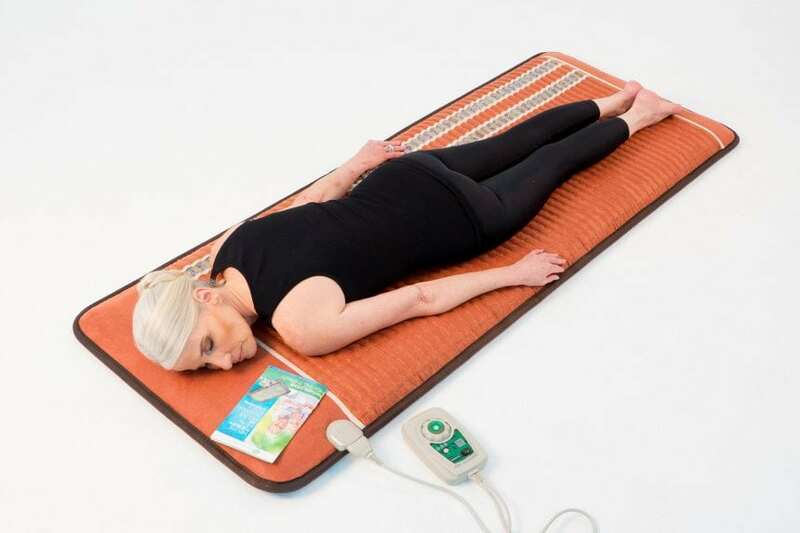 This mat has the added benefit of PEMF. Tourmaline helps to detoxify tissue and body systems. It also emits far infrared and negative ionic energies. These properties help tourmaline to break down toxins within the body that the organs can then process out. When you combine these three technologies with amethyst, jade, or tourmaline, the effects are tremendous. These three stones help to conduct the energies, absorb them into the cells and tissues, and provide grounding properties. All of these elements together pack a powerful punch to tension, muscle spasm, symptoms of chronic illness, stress, and pain. How Does the Mat Construction Make it Superior? The Inframat Pro is made up of 16 layers which make it unique. It contains a synthetic leather outer covering which makes the mat easily sanitized and thermal insulation which keeps the heat from transferring onto the surface on which it is laying. 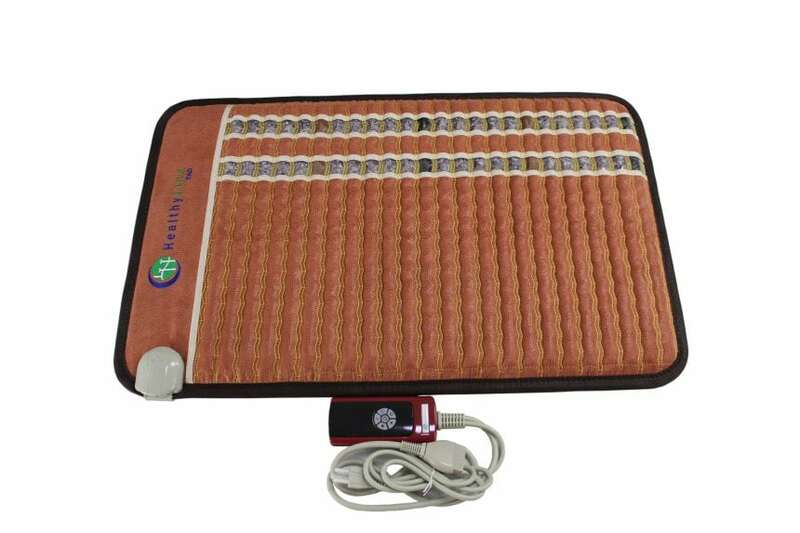 The mat also contains an electric discharging layer which adds to the output of negative ions and a glass fiber layer to deflect electromagnetic waves away from the user. 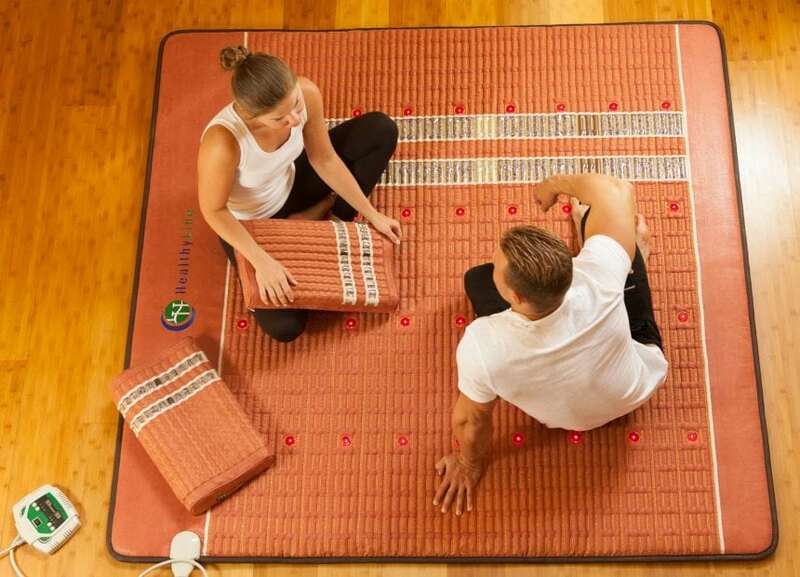 As a safety feature, a heat monitor is included within the mat to prevent overheating. 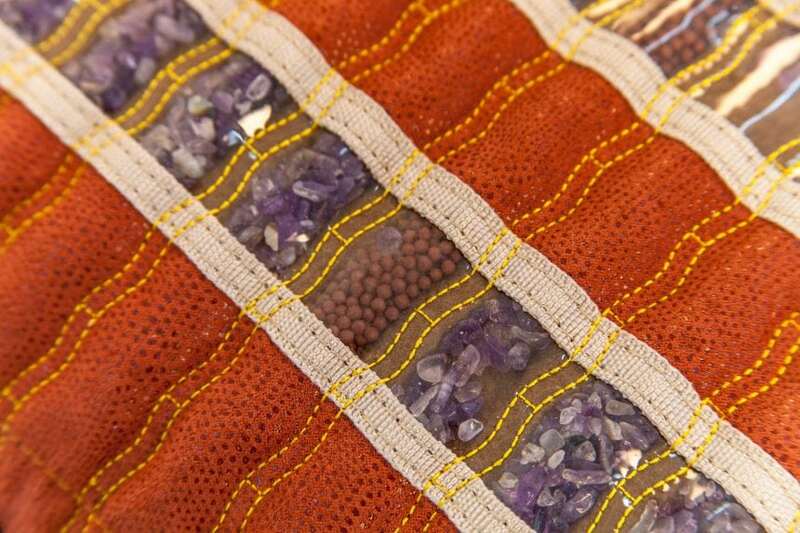 Added to these layers are the amethyst, jade, or synthetic tourmaline which enhance the usefulness of the mat. 32″: Medium size 32″ x 20″ x 1.5″ (80 cm x 50 cm x 3 cm) About 5 lb of top quality amethyst + 0.5 lb of tourmaline ceramic + 0.5 lb of natural obsidian + PEMF. Net weight 12 lbs (6 kg); comes with a carrying case. At 32” x 20” you have a medium mat sized to fit your entire torso or legs or target specific areas of your body. 72″: Full Body (short) size 72″ x 24″ x 1.5″ (180 cm x 60 cm x 3 cm). About 15 lb of top quality amethyst + 2 lb of tourmaline ceramic + 2 lb of natural obsidian + PEMF. Net weight 29 lbs (14 kg); comes with a carrying case. Sized at 72” x 24” you can lay your entire body on it while you are awake and lying still. If you wish to sleep on it and remain on it while you roll over consider a larger mat. Use it on the floor or on top of your bed. 76″: Extra Large size 76″ x 32″ x 1.5″ (190 cm x 80 cm x 3 cm).About 20 lb of top quality amethyst + 3 lb of tourmaline ceramic + 3 lb of natural obsidian + PEMF. Net weight 38 lbs (17 kg); comes with a carrying case. At 76” x 32” you have a large mat that takes up extra space on your bed if you need to roll over or if you just need more width for your mat. 80″: Extra Large size 80″ x 40″ x 1.5″ (200 cm x 100 cm x 3 cm). About 25 lb of top quality amethyst + 3 lb of tourmaline ceramic + 3 lb of natural obsidian + PEMF.About 25 lb of top quality amethyst + 3 lb of tourmaline ceramic + 3 lb of natural obsidian + PEMF. Large enough to cover 2/3 of a queen size bed. 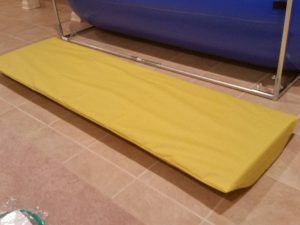 Sized at 80” x 40” it is ideal to sleep on while you move around as you please. 74″ PRO PLUS: Professional Large size 74″ x 28″ x 1.5″ (185 cm x 70 cm x 3 cm). About 22 lb of top quality natural amethyst + 3 lb of tourmaline ceramic + 3 lb of natural obsidian + PEMF. Net weight 34 lbs (16 kg); comes with a carrying case. This mat is for professional use only. Sized at 74” x 28” to fit standard massage tables. It is held in place with mesh so you wouldn’t have to worry about any new product smell. Use it on the floor or on top of your bed. Queen size 80″ x 60″ x 1.5″ (200 cm x 150 cm x 3 cm). About 29 lb of top quality amethyst + 5 lb of tourmaline ceramic + 5 lb of natural obsidian + 5 lb of pure jade. 8 PEMF coils + 36 Photon LEDs. Net weight 71 lbs (32 kg); comes with a carrying case. This mat is large enough to fully cover a queen sized bed. Sized at 80” x 60” it is ideal to sleep on while you move around as you please. King size 80″ x 76″ x 1.5″ (200 cm x 190 cm x 3 cm)About 33 lb of top quality amethyst + 7 lb of tourmaline ceramic + 7 lb of natural obsidian + 7 lb of pure jade. Net weight 88 lbs (40 kg); comes with a carrying case. This mat is large enough to fully cover a king sized bed. Sized at 80” x 76” it is ideal to sleep on while you move around as you please. What Are the Most Common Conditions Inframat Pro Helps? THE 32″ is a mat with all functions built in and movable to target specific areas of your body. THE 60″ is ideal mat that fits your entire body and has all functions built in THE 76″ is the ideal mat that fits your entire body and has all functions built in. You get a high level of negative ions along with far infrared from all three stones, but you also get the powerful PEMF that has become very popular in modern healing, as well is photon light therapy. 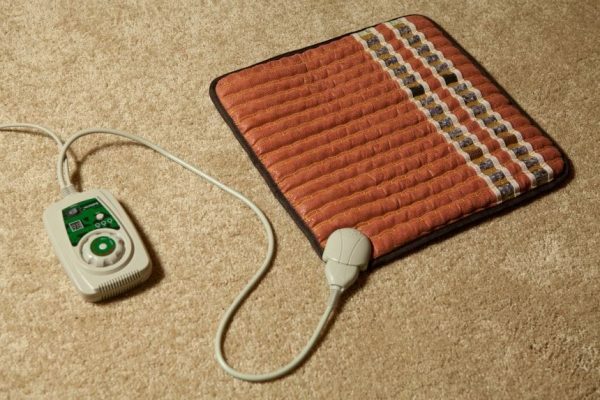 This is a full sized mat that is suitable for your entire body while you are awake and lying still. At 76” x 32” you have a large mat that takes up extra space on your bed if you need to roll over or if you just need more width for your mat. Because the mat is held in place with mesh so you wouldn’t have to worry about any new product smell. Use it on the floor or on top of your bed. Mats with the PEMF feature have an added layer that reduces flexibility. Mats bend easily at predetermined positions. Although you can bend a mat at any position, it is not advised to try to create your own shape out of it because doing so may affect the appearance and longevity of the mat. Because the amethyst used are smaller pieces they tend to be more comfortable than mats made from tourmaline or jade. Amethyst, as a gemstone, is more valuable so mats with amethyst are more expensive but the healing effects are about the same. All natural amethyst is used and different colors don’t affect healing properties. Amethyst is known to give a calming effect. Tourmaline has the highest level of negative ions, with slightly lower levels of far infrared. Natural tourmaline is physically similar to charcoal so it cannot be used in its natural state. We crush tourmaline and mix it with ceramic to make tourmaline ceramic. This way it is sturdy and the process also increases the negative ion output. PEMF or pulsed electromagnetic field therapy is a process of applying magnetic fields to the body. It is used to help with joint repair, blood circulation, and brain function. Frequencies between 0 Hz to 100 Hz (Hz is a measure of cycles per minute) have been found to be beneficial. HealthyLine uses a frequency of 7.8 Hz which is the same frequency as the earth’s magnetic field which also helps to reverse the effects of harmful EMFs cause by electronic waves such as radio towers and cellular data. The PEMF function operates at cycles of 20 minutes powered followed by 100 minutes turned off: this cycle has shown to be most effective. At 3 gauss the magnetic field is has the same strength from the surface of that mat up to 3 feet above it, so it will reach your entire body. Photon light therapy uses near infrared light. LEDs stimulate cell growth throughout the body. To be effect the photon lights have to make direct contact with your skin. This is an optional feature and can be turned on/off with a button. For a sauna effect use the mat at 60-70C for about 30 minutes, while covered with a blanket. For overnight use set it to about 45-55C, according to your comfort. It is suggested to place a towel on the mat, instead of lying on the stones directly, to protect the mat from sweat. Human body temperature is approximately 38 degrees Celsius so that would be an ideal point to start. 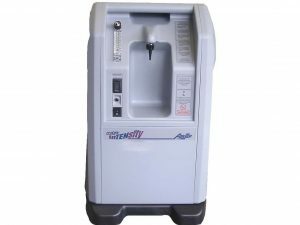 Gradually increase the temperature to test your tolerance. Set your temperature lower for longer usage and higher for shorter periods. Always drink lots of water before, during, and after use to prevent physical effects of dehydration. Safe for pets and children. PEMF can be used while mat is heated. Photon lights must make direct contact with skin to be effective. Treating cancer with the triad of voltage, alkalinity and oxygen is an interesting new approach because it treats the fundamental reasons cancer cells form and get aggressive. What is most interesting is that voltage, alkalinity and oxygen levels track each other. They all increase or decrease together yet we can use treatment approaches that focus on each of the triads arms. Cancer thrives in an acidic low voltage low oxygen environment, and doesn’t survive in a normal, more alkaline (high voltage) environment. Cancer cells make your body more acidic as they produce lactic acid. Combined with other treatment approaches regulating cell voltage is another way of treating cancer. Researchers in the US have already found out that simply regulating the voltage of tumorous cells could be enough to stop them spreading out of control but when combined with oxygen (hyperbaric chambers), sodium bicarbonate, remineralization and super nutrition we have a cancer approach that is worth consideration. Low-level electromagnetic fields are known and used to halt cancer cell growth. Voltage is synonymous with electromagnetic fields. 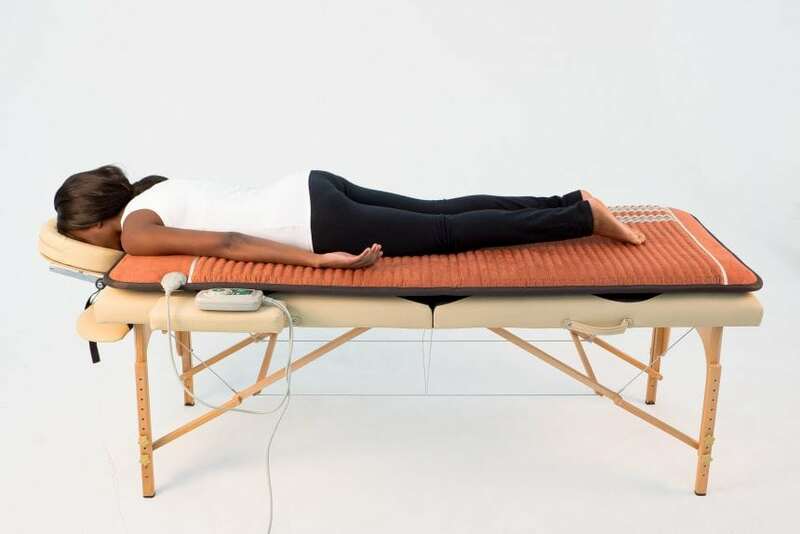 Pulsed Magnetic Field Therapy (PEMF) is FDA approved to promote the healing of non-healing bone unions and has been used in Europe for over 20 years with individuals with cancer, migraines, sports related injuries, wound healing and other pain syndromes. In layman’s terms, low-frequency pulses create a brief, intense voltage around each cell. The mitochondria within the cell grab some of this energy. This, in turn, makes the cell more efficient at producing ATP and delivering oxygen throughout the body. Using microcurrent is a more direct way of bathing cells with voltage boosting ATP production even higher than PEMF techniques though the two can and should be used together.